Turkish government issued an alert on a wanted terrorist for his links to deadly Iran-backed terror group called Tevhid Selam yet the same government detained a journalist who wrote extensively on this terror group, saying that there is no such terrorist organization. Gültekin Avcı, a columnist who has been in jail for 15 months without a conviction, was indicted in March 2016 for his views in seven articles that revealed Tevhid Selam network in Turkey and named Iranian intelligence operatives and Turkish informants. His writings were based on confidential investigation into Iran’s clandestine activities in Turkish soil. He is facing a lifetime sentence and an additional jail term of up to 75 years if he gets convicted. When Tevhid Selam probe implicated senior government officials including the head of National Intelligence Organization (MİT) Hakan Fidan in 2014, the government hushed up the probe. The case was formally dropped on July 22, 2014 under pressure by the government. Instead, the government orchestrated the arrest of over 100 police investigators as well as 52 judges, prosecutors who had overseen the probe. While the Islamist-rooted Justice and Development Party (AKP) claimed Tevhid Selam as hoax, Interior Ministry issued an alert on a wanted terrorist over Tevhid Selam terrorist group. In an orange list maintained by the General Directorate of Security (Emniyet Genel Müdürlüğü) on wanted terrorists, a Turkish national identified as Oğuz Demir is being sought for an arrest on charges of being member of Tevhid Selam’s Quds Force. Demir was accused of being involved in the murder of journalist Uğur Mumcu when the bomb that was placed beneath his car on Jan. 24, 1993 was exploded. Tevhid Selam was designated as a terrorist group in Turkey in three different rulings issued by the Supreme Court of Appeals in 2002, 2006 and 2013. The group is responsible for the murder of eight people in the 1990s, including Mumcu, Professor Bahriye Üçok, journalist Ahmet Taner Kışlalı and several other Kemalist/secularist intellectuals. The deadly terror group also assassinated foreign diplomats such as Abdul Ghani Bedawi, a Saudi diplomat working as second secretary at the Saudi Arabian Embassy; Ehud Sadan, the Israeli Embassy’s top security officer in Ankara; and Victor Marwick, who worked for a Turkish-US logistics group. Despite all these convictions and existence of a body of overwhelming evidence about Tevhid Selam, the AKP government officials and president Recep Tayyip Erdogan insisted on calling the group as ‘so-called terror group’, claiming it was fabricated. Journalist Avcı was charged in connection with a series of columns he wrote in 2013 and 2014 for Bugün daily in which he alleged that the Turkish National Intelligence Organization (MİT), the country’s spy agency, had links to a group called Tawhid-Salam. The indictment against Avcı has been sent to İstanbul 14th High Criminal Court after it was approved by the İstanbul Chief Public Prosecutor’ Office but no hearings has been conducted in the case yet. Mehmet Ali Tekin, sentenced in absentia to 12 years and 6 months jail on Jan.17, 2013 by Ankara No.11 High Criminal Court for leading and administering Tevhid Selam group, was caught in Azerbaijan and handed over to Turkey on July 15, 2016. His sentence was upheld by Supreme Court of Appeals April 10, 2014. Turkey had been seeking for his arrest with a red Interpol notice following his conviction was held at the appeal. Tekin was brought to İstanbul and Bakırköy court arrested him on prior conviction ruling. Journalist Avcı was detained on Sept.21, 2015 over his writings about Tevhid Selam and released on June 8, 2016 after nine months in detention. He was again detained on August 25, 2016 and arrested. He is still in Silivri Prison in İstanbul. 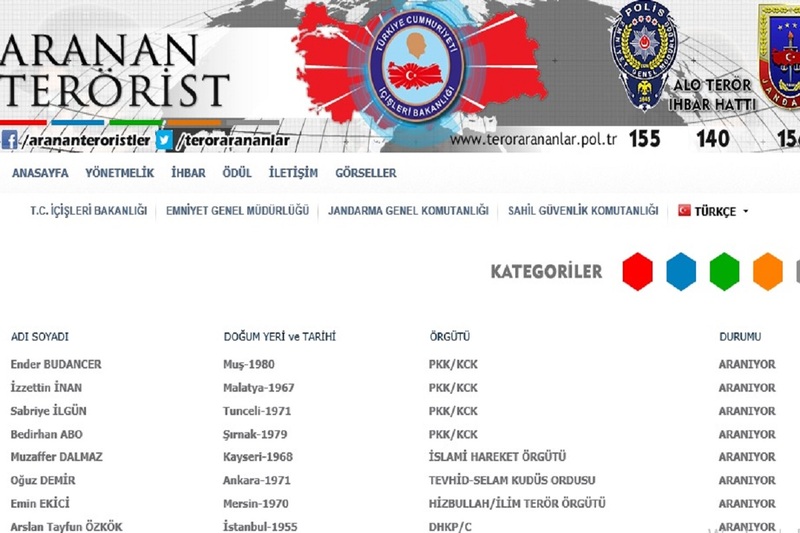 In an orange list maintained by the General Directorate of Security (Emniyet Genel Müdürlüğü) on wanted terrorists, a Turkish national identified as Oğuz Demir is being sought for an arrest on charges of being member of Tevhid Selam’s Quds Force.